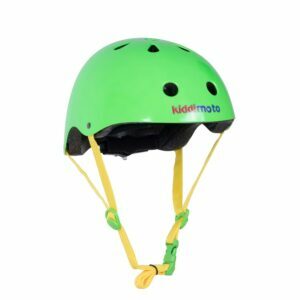 Kiddimoto has a cool, yet affordable range of children’s’ bike helmets, bringing style and safety together. These kids’ helmets don’t just look great, but meet all helmet safety standards. We love any helmet with the dial-adjust fitting ; easy for parents or kids to adjust for a snug fit. Eleven little vents keep your child’s head cool. A rear adjustment wheel, internal comfort padding, and adjustable straps help to ensure a perfect fit. Made from lightweight ABS hard plastic.